Hey there! Thanks for dropping by Trev & Gaila Cooking! Take a look around and grab the RSS feed to stay updated. See you around! corn flour, just a little…. sorry for not being so precise! First things first you will have to cut the top of your sponge and that will become the bottom of the cake. Then divide it in three equal parts. Put it aside for now, time to make some fire 🙂 use the juice from 1 of the jars of cherries, add your Kirsch, you might need to add a little sugar depending on what your cherries are marinated in. We didn’t though. Bring to the boil and carefully (without burning you hand or burning the house down) set fire to the liquid to burn the alcohol. It’s up to you how much of it you want left in 😉 you don’t need to burn any at all! You want to start building the cake on a cake stand or a big plate, a dish that it will stay on. 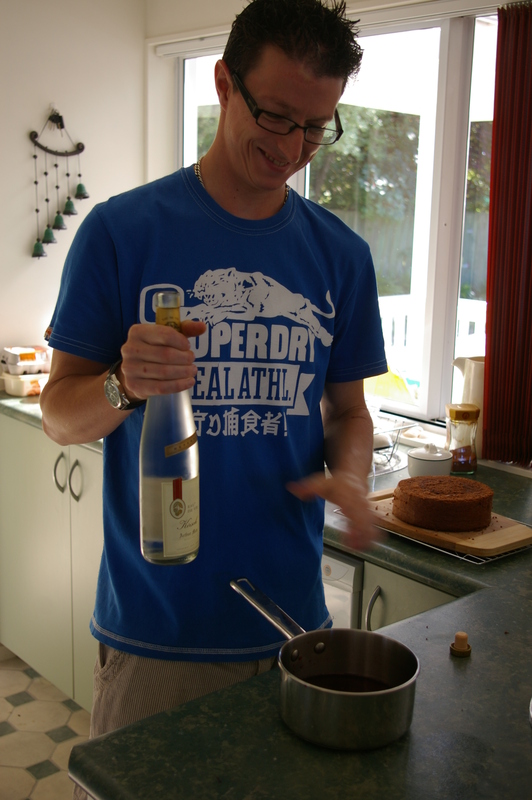 Cover the first layer of the sponge with the syrup, remember the top of the cake is now the bottom. You could put more cream on the bottom of the second layer, place the second layer on top of the cherries. 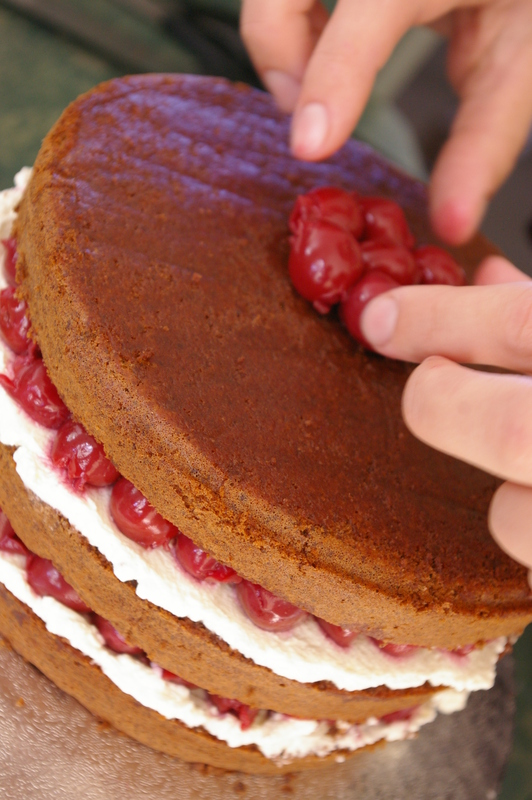 After you covered your sides nice and thick time to glaze the cherries on the top of the cake. To make the glaze use the syrup that you used to brush the sponge, thicken it with a little corn flower over a low heat. Don’t forget to taste 😉 most important part of cooking! When the glaze is nice and thick (and tasted) pour it over the cherries but don’t let it run on the sides. Now you can put that beauty in the fridge. Next you will have to prepare the chocolate that you will use to cover the sides and decorate it. So break your chocolate in a heat proof bowl and melt it over steaming water. Yay! We did it!!!! What do you think? Hello everybody 🙂 We hope you are all keeping well? As you probably know the Black Forest Gateau won the poll, we decided to split the recipe into two, as chocolate sponge can be used for many different desserts. Right so first things first, preheat your oven to 180 c (350 f) and as always get your ingredients together. When you have got your ingredients together you will need to sieve your flour and cocoa together, then it is time to prepare your baking tin. We used an 8 inch tin. Grease it, then line the sides first and a circle piece for the bottom (as seen in the photo). The mixture will triple in size, so please make sure you have a big enough bowl. 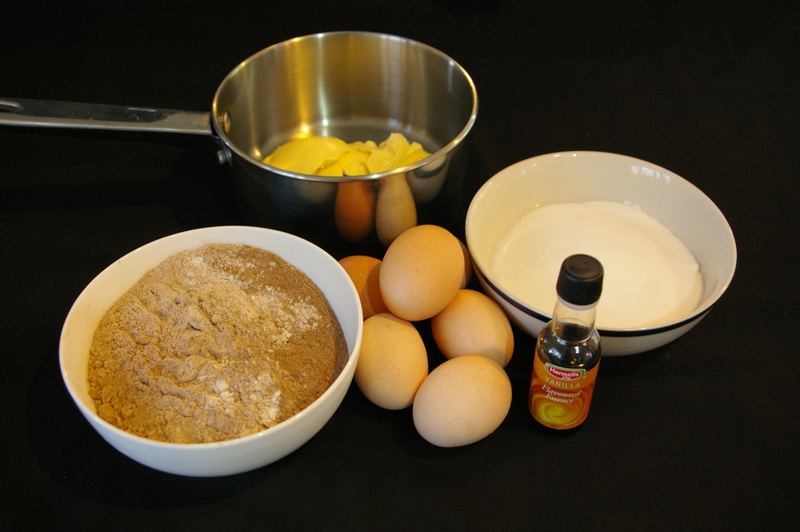 The consistency should be pale and thick, when you lift out your whisk it will hold a trail. Take off the heat and continue whisking for another 5 minutes, till the mixture has cooled down a bit. Fold in the flour/cocoa mix using a metal spoon. Be gentle now, as you don’t want to knock out the air you put in (now you understand why you need a big bowl?) When your flour is folded in, fold in your butter and vanilla extract. Bake for 40 mins, until your sponge has risen slightly and comes away from the edge a little, we always test it with a needle, if you poke the middle it should come out clean, if it doesn’t your sponge is not cooked yet. I wish you could smell our house at this point! We wanted to eat the sponge straight away. Hope you are all good! After a week the votes are in and the winner is the truly irresistible – Black Forest Gateau! Today we have been shopping for all the ingredients and equipment and are ready to rock and roll 🙂 After a nice cold beer we will crack on with the sponge. We both decided that it isn’t fair to keep all these goodies to ourselves so we invited some friends over tomorrow for a tasting and hopefully a thumbs up approval 😉 So if you are in Greytown tomorrow pop in! Thank you to everybody who made the effort to vote, the support and comments mean a lot to us newbies to this. Enter your email address to follow this blog and receive notifications of our cooking adventures by email. Good old fashioned lemon posset! A day out around Helensville! Trev and Gaila Cooking by Trev and Gaila is licensed under a Creative Commons Attribution 3.0 Unported License. Based on a work at trevandgailacooking.wordpress.com.